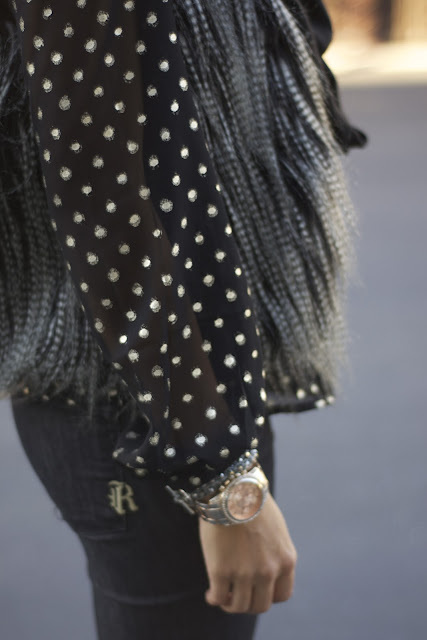 I love the look of mixed textures, like this fur vest paired with a delicate chiffon blouse. They are both similar colors and they work so well together. Plus, this super chic vest kept me really warm! I spent the day in Berkeley with my husband browsing shops, drinking lattes, and eating way too many sweets. If you are every in Berkeley you must go to CREAM- Cookies Rule Everything Around Me. You pick a type of cookie, then a type of ice-cream, and enjoy one of the most delicious creations ever. Trust me, it's worth the 20 person long line. That vest is fabulous! I love it over the polka dot blouse. And the booties are killer, too! Liked it.. though not completely convinced with the idea.. Well no doubt your choice of stylish clothes is awesome..